This is among the most well known mountain bike rides in the Santa Cruz Mountains. It's a route that provides an out-of-proportion amount of singletrack fun for its short length. The percentage of singletrack on this ride route is among the highest that you'll find in the Peninsula or the South Bay, and even the entire Bay Area (at least among the rides listed on this site). All of this singletrack is laid across a beautiful and shady forest landscape, and it's punctuated by a sunny fire-road segment providing some great views that you'll be traversing twice on this ride. The obvious parking option for this ride is what I would call a medium-sized parking lot that's at the intersection of Route 9 and Skyline Boulevard (Route 35). This free lot fills up quickly on weekends with nice weather. Try to arrive early in the morning. There are another four spots or so available right at the trailhead of Saratoga Gap Trail off Route 9 near the same intersection. Beyond these, I know of no further parking options, unfortunately. However, I do see spill-over parking along Skyline near the parking lot sometimes. The ride starts out on Saratoga Gap Trail, which is a hillside singletrack that closely parallels Skyline Boulevard, though you don't get to see the road from the trail except at one particular spot. Skyline Boulevard makes its present felt mainly by its noise. The sounds of cars and motorcycles passing by (often very fast) is a frequent occurrence, though I've never felt that this takes much away from the ride. Saratoga Gap Trail begins right from its trailhead with a stiff climb. You may get winded before you even warm up unless you pace yourself through the first 300 yards you cover on this trail. That first climb crests where a large oak tree right next to the trail acts as a natural reference point. After that, the trail dives into a shady descent of a length roughly equivalent to that of that first climb. This stretch is quite rocky and rooty and currently constitutes the longest technical stretch on Saratoga Gap Trail. Any inexperienced riders trying out this route for the first time might be a little disheartened by this relatively techy descent arriving so early, but they need not be. That descent ends at the first hairpin turn you encounter on the ride and there is no other stretch like this over the rest of Saratoga Gap Trail. You might hear some seasoned locals pining about how much better Saratoga Gap Trail used to be. What they are referring to are about five or six specific technical features this trail used to have. These were smoothed over by some trail work performed in November 2016. One of these was that first fairpin turn at the end of the first techy descent on the ride. Another one was a notorious tree root that formed a small cluster of steps of black-diamond difficulty. At the moment, these spots are rideable even by beginners. It's worth keeping this in mind in case you come across someone who tells you how difficult a ride Saratoga Gap is. On the other hand, such spots on a trail never remain the way they are. With wear and erosion, they will surely return to their challenging state in a few years, and they may already be there by the time you read this. Crossing Skyline Boulevard on the ride brings about significant changes. On the Long Ridge side, you are greeted almost immediately with the ride's first steep fire road climb, though it's a very short one. After that, you spend some more time on fire roads, with the exception of a short and scenic singletrack segment. These fire roads have several more steep stretches, which you'll mostly be descending on your way out and, therefore, mostly climbing during your return. On the positive side, these fire roads also happen to include most of the brief period where the ride becomes very scenic. For a few minutes, the trail opens up completely to views looking down toward other ridges between there and the coast, and—when the weather allows it—all the way to the ocean. Before long, the ride dives into tree cover again and back onto singletrack on Long Ridge Trail. 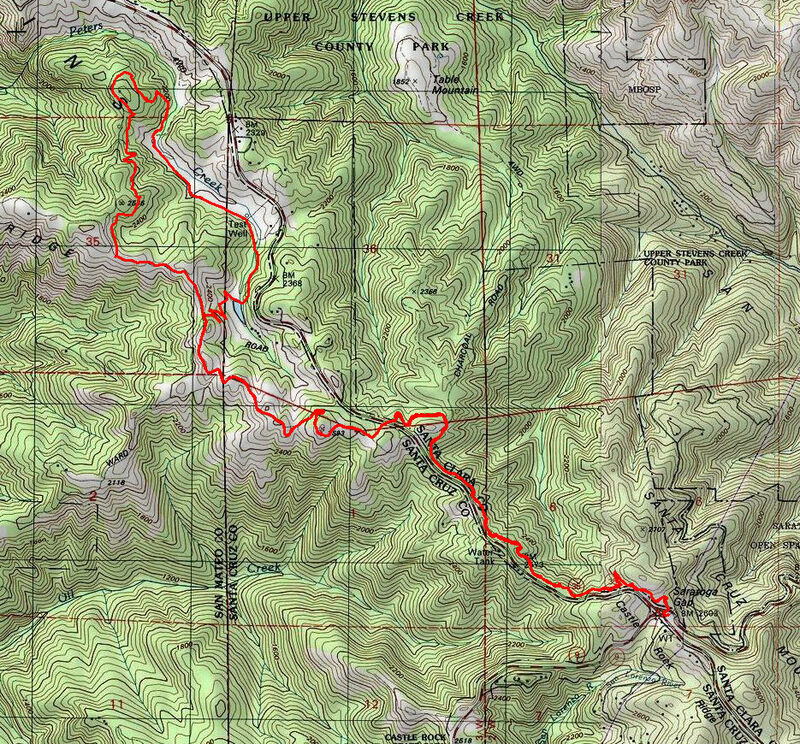 This is a non-technical trail that sweetly twists through the hills while not changing elevation very significantly. It begins to descend shortly at a moderate grade and then climbs a little at an even gentler slope. There are a few a switchbacks in the descending part, at least one of which is a rocky and somewhat tricky one. But the only significant technical feature on this trail arrives when you round the northern tip of the loop you see on the route and the trail begins a very steep descent toward Peters Creek. The grade of the trail reaches at least -30% on this descent and possibly even closer to -40% for a few moments. The trail is fairly wide in that stretch, but not particularly smooth. The surface is somewhat uneven, punctuated by a few roots and usually covered in dead leaves. Less experienced riders would not want to be caught unprepared when approaching this descent. That extra-steep descent ends right next to a gorgeously picturesque spot on Peters Creek. From that point forward, Peters Creek Trail begins a gentle climb all the way up to a locked entrance gate of Jikoji Zen Center right next to a cute pond. After passing by the pond, Peters Creek Trail decides to gain elevation in earnest and begins a switchbacking climb with a reasonable grade back up to Long Ridge Road again. Most of the ride is under fairly dense tree cover, with the part along Peters Creek being particularly dense and lush. The only exception to this is the scenic stretch of fire roads that I mentioned on the Long Ridge side of the route. There are no extended climbs or descents along this route. The difference between the highest and lowest elevation points on the route is only 500 feet. In fact, three quarters of the ride's mileage is constrained to within a 200-foot band of elevation. But, the lesser undulations along the way do add up, and I wouldn't classify this as a physically easy ride, though it wouldn't pose a serious challenge to any experienced rider either. 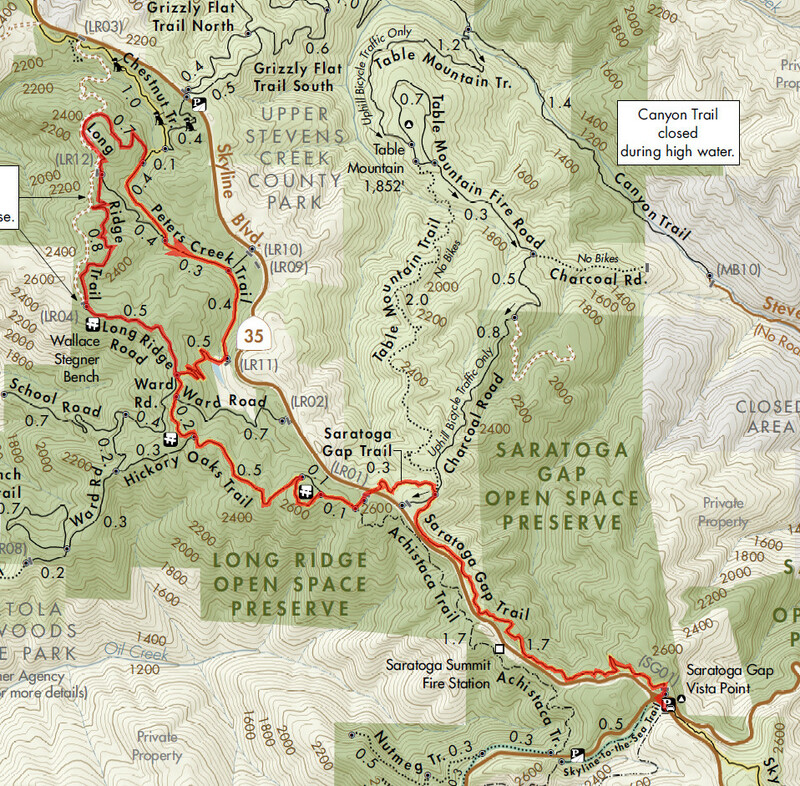 One important note for anyone who will plan to do this ride is the fact that Long Ridge Trail and Peters Creek Trail are subject to seasonal closure. I think the beginning and ending dates of this closure is driven more by weather conditions than by a predefined calendar, but I don't remember any winter when these trails weren't closed at least for a few weeks. Check the Long Ridge website link you'll find on the left to look up the current status if you're not sure. One of the perks of this route is the set of possibilities it provides for side trips. One common extension many people add to this ride is by taking the short connecting trail to Skyline Boulevard after reaching Peters Creek, taking Grizzly Flat Trail on the other side down to Stevens Canyon, and then returning to Saratoga Gap Trail by way of Table Mountain Trail and Charcoal Grade (i.e., this other ride). It's an all-fire-roadside trip (except for the brief, challenging, and uphill-only Table Mountain Trail) but it's still worth a try. I should warn you, though, that Charcoal Grade is a notoriously steep climb. Another option is to extend the ride further north by taking Chestnut Trail at the very northern tip of the route toward Skyline Ridge Open Space. (Some trail signs still refer to this segment by its former name: "Ridge Trail".) That one is a singletrack that follows a very pretty little valley. You could even take Grizzly Flat Trail but continue on Canyon Trail all the way to Stevens Canyon Road and then return by way of Redwood Gulch Road and Route 9 back to the trailhead. But, you'd be exchanging the returning singletrack portion of the ride with plenty of road riding, if you do that. Finally, especially if Saratoga Gap Trail was your favorite part of this ride, you might like to ride a second spur heading south from the parking lot for this ride, on Skyline Trail. This trail is situated very similarly to Saratoga Gap and has the same character over most of its length, though it does take more work due to its longer climbs and descents.